Unlike most Western pundits, I have spent time in Ukraine, dwelled in Khrushchev's Kiev apartment blocks, journeyed by train to Odessa and seen the city’s port from the steps where Eisenstein filmed. This is the land of Shevchenko, and the birthplace of Gogol and Prokofiev, Trotsky and Gorbachev. This is where Catherine the Great brought her empire to the Black Sea. Today, 40 percent of Russian Orthodox parishes are in Ukraine. Vladimir made Christianity the official state religion of Kievan Rus in the year 988. By comparison, Spain was still a Muslim country. In the 20th century, Ukraine suffered immensely under Stalin's insanity, designed and produced the T-34 tank that helped him defeat Hitler and was crucial to the greatest social engineering experiment in the history of man, a vast laboratory based on the theories of Europe's most influential thinker since Aristotle: Karl Marx. Who would now suppose that Ukraine is not really part of Europe? 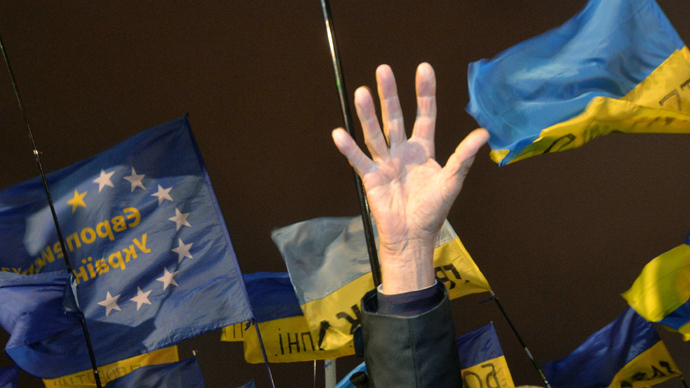 Like many people in Russia today, Ukrainians feel that history cheated them. While Russians blame the Bolsheviks, the end of the Romanov dynasty and the brutal Communist system that dominated for so long, its atheism, structural mismanagement and inefficiencies... Ukrainians just blame the Russians as a bad influence, period. A generation after the triumph of Ronald Reagan and the Soviet Union's curtain call; the promise of free markets, free people and great hopes for a sunny future, Ukraine is not improving and many see Yanukovich as a relic from a bygone era. He even looks like a 1950s version of Soviet man. Rage sweeps across Maidan Square. Young Nationalists and Westernizers dream of a prosperous, democratic and sovereign Ukraine where transparency and the rule of law hold sway. The 1,300-page Association Agreement with the European Union was going to provide the template, require the adoption of 350 EU laws and eliminate tariffs. Monopolies would be dismantled and the Ukrainian economy would be rescued from stagnation. Finance would become available and the country saved from impending economic doom. For the protesters across Ukraine, Yanukovich stole the dream. Their outrage at the president's decision to say no to the EU has much to do with deep Ukrainian identity politics and is actually a vote of no-confidence in Ukraine's past and present. No politician wins re-election when the economy is shrinking. Yanukovich may need to retire for the sake of his Party of Regions. The Ukrainian oligarchs will have the final word about his fate; they control the media in Ukraine. Young Ukrainians may not know who they are anymore and may have been seduced by global consumer culture and media, just as their parents were seduced by Coca-Cola and blue jeans a generation ago. They do have real grievances, but the European Union and the International Monetary Fund will not affirm Ukrainian identity and bankroll the journey to the freedom and prosperity that was supposed to be delivered after independence from the Soviet Union in 1991. On the contrary, Yanukovich could not do the deal because the EU insisted on a sharp increase in gas prices to Ukrainian homes and the adoption of a neo-liberal agenda in Ukraine, among other requirements. Brussels designed the EU proposal to either be accepted, causing Yanukovich to fall from power, or to be rejected and cause Yanukovich to fall from power. Ukraine signing the Association Agreement with the EU would undermine Russian export markets in Ukraine and open the door to US military bases in that country. The EU negotiations excluded Russia and attempted to force Ukraine to choose the EU at the expense of its big northern cousin. This strategy backfired and sent Ukraine into Putin's arms. But the young people and the naive people in Ukraine don't care about geopolitical chess games; they just want their piece of the pie... but it is pie in the sky to think the EU will make Ukraine rich. The European Union is not a charity. It is an economic and political bloc designed to compete with the United States. The euro was created to compete with the US dollar. This bloc unified countries that were bitter enemies in the past and made them stronger by reducing the cost of doing business and facilitating trade among themselves. The end of the Council of Mutual Economic Assistance (barter club) in the east and the unification of Germany set the stage for the European Union to be what it is today: an economic giant with Germany leading the way. Today, when you board a commercial airliner, chances are about 50/50 you will be on board a European Airbus or an American Boeing. Yanukovich made the right decision to avoid ceding control of Ukraine to the EU and IMF. The aim of the EU is to expand influence and the International Monetary Fund is notorious for policies and recipes that lead to perpetual debt and dependency of nations, especially in Africa and Latin America. Their agenda is to privatize industry and ensure compliance with American geopolitical goals. Privatization can increase prosperity and sometimes American goals are altruistic, but it is naive to believe that Ukraine's association with the EU would solve Ukraine's economic problems and bring material benefit without ceding control to Western powers. Association with the EU and IMF would alleviate some problems in the near term and create new economic problems thereafter because Ukrainian industry cannot compete with Western corporations. Spain has 25 percent unemployment, bankrupt provinces and a secession movement centered around wealthy Barcelona. Italy and Portugal can barely pay the interest on their bonds, which can never be paid off in full without creating euros out of nothing. Germany will not permit this. Hungary is in deep economic trouble and is experiencing a fascist revival. Then there is Greece. Ukrainians need to take a hard look over the horizon and take stock of what happens when the Eurozone suffers the structural failure of a member state. It’s called austerity, and it’s the new watchword all over Euroland. The details of the Greek default and tragedy are well known and do not need repeating here. The situation in Cyprus doesn’t give much hope, either. In March, the European Union stole billions of euros from depositors at Cypriot banks. The EU called it a bail-in. Now they say they will be forced to do the same in other EU countries in the near future. In Cyprus, many of the victims were Russians. To be frank, the EU's attitude was that they had it coming because most of the Russian depositors are gangsters and oligarchs anyway. As for the Greeks, they are lazy and need to learn some discipline. Once Ukraine is associated with the EU and needs help, they will be viewed with similar disdain by Western Europeans. The European Union and the International Monetary Fund don't give anything away for free. They buy influence, interfere in the internal affairs and dictate the foreign policies of vulnerable nations in the interest of global banks and Western governments. Debt is their primary tool. In Ukraine, the EU sabotaged itself by meddling in the Yulia Tymoshenko case before it had enough leverage over the country to dictate policy. President Yanukovich is holding out for a sweeter deal from the EU and Russia but patience has worn out and sitting on the fence is no longer an option. He opted for Russia but is unwilling to meet Russian requirements for more substantial financial relief, which Ukraine must soon obtain to avoid a deeper crisis and the fall of his government. The Shanghai Cooperation Council may be the best option for Ukraine. In concert with Russia and China, Ukraine could partner with the BRICS. Muslim Turkey, long snubbed by the EU, has said it will also join the SCC if the European Union continues to deny it membership in the bloc. Economic opportunity and democracy, the rule of law and transparency... are home grown, not imported from the EU. At the end of the day, Ukraine can, by itself, change for the better, uphold Western European standards, observe the rule of law, encourage entrepreneurship, encourage foreign investment and make Ukraine a great place to do business. If Ukraine continues to improve in these areas, it will, in time, be in a strong position to negotiate terms of trade with the rest of Europe and the world. The statements, views and opinions expressed in this column are solely those of the author and do not necessarily represent those of RT.